Store and handle wire rope slings correctly. Inspect wire rope slings and accessories before use and before placing into storage. Follow safe slinging practices, as given overleaf. Fit slings carefully, protect them from sharp edges and position hooks to face outward from the load. Apply the correct mode factor for the slinging arrangement. Back hook free legs to the master link. Attempt to shorten, knot or tie wire rope slings. Force, hammer or wedge slings or their fittings into position. Lift on the point of the hook. Use wire rope slings in acidic conditions without consulting the supplier. Use wire rope slings at temperatures above 100°C or below minus 40°C without consulting the supplier. 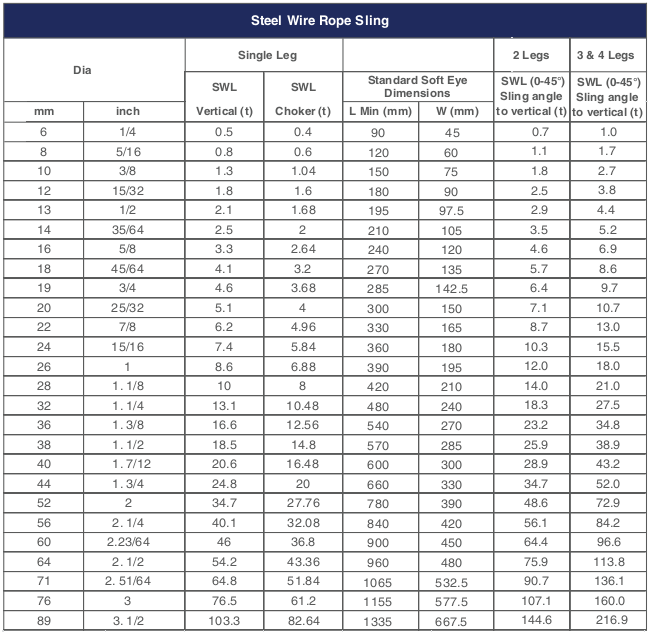 Shock load wire rope slings. Type of sling to be used – endless, single, two, three or four leg. Capacity – the sling must be both long enough and strong enough for the load and the slinging method. Apply the mode factor for the slinging method. For use at temperatures exceeding 100°C or below minus 40°C refer to the suppliers instructions. Where slings may come into contact with acids or chemicals consult the supplier. In the case of multi-leg slings the angle between the legs should not be less than 30° or exceed the maximum marked. Multi-leg slings exert a gripping force on the load which must be taken into account, this increases as the angle between the legs increases. Due to the possibility of sparking, the use of aluminium is restricted in certain classified atmospheres, so ensure the ferrule is suitable for such conditions. Never return damaged or contaminated slings to storage. They should be dry, clean and protected from corrosion. Store wire rope slings on a rack and not lying on the ground. The storage area should be dry and free of any contaminates which may harm the sling. Do not alter, modify or repair a wire rope sling but refer such matters to a Competent Person. Do not attempt lifting operations unless you understand the use of the equipment, the slinging procedures and the mode factors to be applied. Do not use defective slings or accessories. Do not force, hammer or wedge slings or fittings into position. They must fit freely. Check to ensure correct engagement of fittings and appliances. Position hooks of multi-leg slings facing outward from the load. Do not lift on the point of a hook. Ensure that the wire rope is not twisted or knotted. Ensure the effective diameter of pins, hooks etc upon which soft eyes fit is at least 2 x the wire rope diameter. Position the splices of endless slings in the standing part of the sling away from hooks and fittings. Never join wire rope slings made from different lays of rope together as this will cause them to un-lay thus seriously affecting their capacity. Back hook free legs to the master link to avoid lashing legs which might accidentally become engaged or otherwise become a hazard. Take the load steadily and avoid shock loads. Do not leave suspended loads unattended. In an emergency cordon off the area.